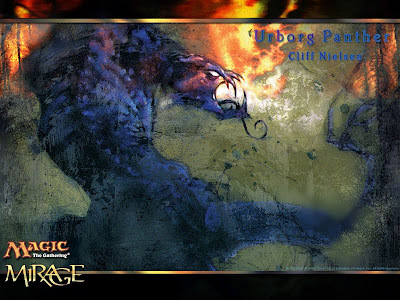 Until the publication of Coldsnap to finally finish the Ice Age block, the Mirage block was the oldest 3 set block in Magic history. Prior to that publication, sets were simply released as either core set reprints, two set blocks (Ice Age/Alliances), or single set expansions to that set. Mirage block ushered in a new way to play: Block Constructed magic was a completely new game consisting of only cards in the specific block in question. Suddenly the game got a lot smaller. Cards that might otherwise be tossed aside in larger constructed environments now suddenly had a role to play. The flavor and "feel" or the game changed too. Cards were made specifically for each other both mechanically and thematically. 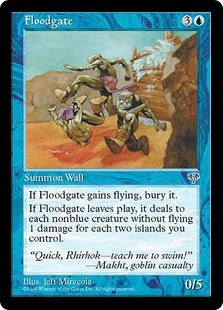 Block constructed is one of my favorite Magic formats. I like how elegant the card pool is. I appreciate that it's essentially a static format that isn't going to change once the three sets that make up a block are released. I can build my decks and put them away and when I fetch the decks to play with them again they are always relevant to their format. Here are some of the decks that I've recently put together. 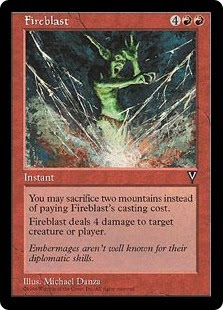 At the time this deck was known as "Celerity Red" since it had a number of haste creatures in the deck before "Haste" was even a keyword (Why didn't they keyword it Celerity? One wonders. I suppose Haste rolls off the tongue better). Aside from running almost exclusively haste creatures, this deck also features 20 burn spells, hence the more current "Red Deck Wins" moniker. That's a lot of heat to be packing. 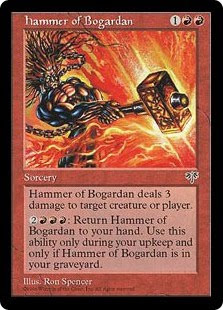 You're looking at 52 + X face damage and that's not even including the recurring Hammer of Bogardan. What prevents this deck from being completely ridiculous is a lack of card draw options. Because of this it just has to settle for being really good. 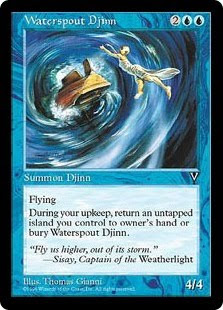 In the sideboard you address several weaknesses the deck has issues with. Ground creatures with a toughness greater than 3 can be a real problem for this deck so Spitting Earth is included to deal with those potential damage inhibitors. Cursed Totem can shut down a number of potent creatures in the metagame: Vodalian Illusionists, Ophidian, and Necratog to name the more prominent ones. Reign of Chaos is pure hate on blue or white decks. Lightning Cloud can give an edge in the mirror match and Builder's Bane can eradicate troublesome artifacts like Bubble Matrix. For pairing purposes I like to match this up against another heavy hitter on the tournament scene at the time. Big Blue combined denial and card draw to play into powerful finishers. This control deck leveraged ophidian and inspiration to generate card advantage, impulse to find answers to threats, and then dropped a djinn or efreet to finish the opponent off. It protected itself with memory lapse and answered Hammer of Bogardan recursion with Dissipate, the perfect foil. Big Blue's sideboard procured disrupt for the mirror match, serrated biskelion to deal with smaller creature threats, floodgate to prevent it from getting run over, and bubble matrix to combat the red damage decks in the format. Big Blue was a force in this format way back in 1997. Because block decks are static and the environment unchanging, it's still a force in this format today! 0 Response to "Block Constructed Magic: A look at the Mirage Block Archive"